At this point in our story it’s still the spring of 1934. Before renting Shirley Temple out to Paramount to become a star, Fox frittered her away in one more pointless bit in Now I’ll Tell. Actually, the picture’s full title on screen was “Now I’ll Tell” by Mrs. Arnold Rothstein, and as that suggests, it purported to be the inside dope on the high-flying life and mysterious death of Mrs. Rothstein’s deceased husband, the gangster/gambler who fixed the 1919 World Series, was shot in November 1928 (apparently for welshing on a poker debt), and died two days later refusing to name his killer. Names were changed to protect the guilty, so Spencer Tracy starred as “Murray Golden”, with Helen Twelvetrees as his saintly, noble wife (Mrs. Rothstein wrote the story, remember! ), and with Rothstein’s many mistresses combined into one person and played by 18-year-old Alice Faye. Shirley’s role was an inch or two better than in Change of Heart: 42 seconds on screen and a whopping five lines of dialogue (to wit: “And we saw a cow there, too!”, “Does a black cow make black milk?”, “Good night”, and “Good night, Daddy” — twice). Publicity poses like this one may have led Shirley to misremember her role as that of Tracy’s daughter; in fact, she played the daughter of Tommy Doran (Henry O’Neill), a boyhood chum of Golden’s who grows up to be a police detective — on the other side of the law from his old pal. A decent enough gangland melodrama, Now I’ll Tell hit screens one week after Little Miss Marker, and could only have underscored Fox’s cluelessness. First, an explanation of a trivial point, just so you don’t suspect sloppy copy editing here at Cinedrome. 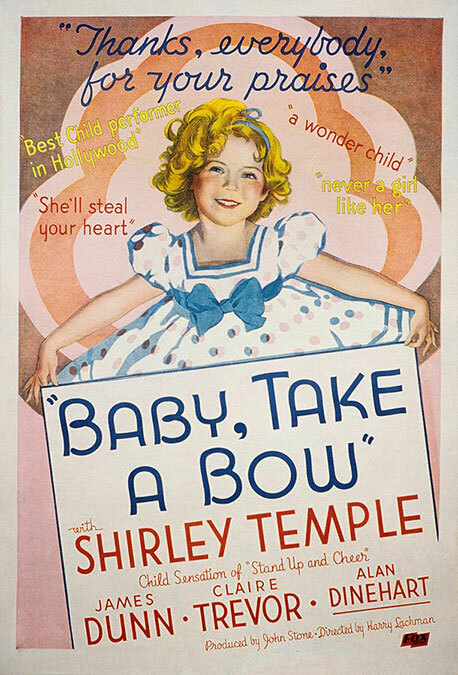 The title of Jay Gorney and Lew Brown’s song “Baby, Take a Bow” has a comma, and the comma appears in this and some other posters, ads and lobby cards for the movie. But it’s not on the picture’s main title card as it appears on screen. Therefore, I’ll be using the comma when referring to the song, but not using it when I’m referring to the movie. Got it? Anyhow, “Baby, Take a Bow” isn’t in Baby Take a Bow — except as a line of dialogue spoken by James Dunn (once again playing Shirley’s father); but more of that later. There’s an intriguing mystery about the source material for Baby Take a Bow that’s worth going into before we get to Shirley’s version of it. It was originally a play by James P. Judge titled Square Crooks that ran on Broadway for 150 performances in 1926. That was a pretty decent run in those days, especially for a one-set play with a cast of nine, so Square Crooks probably turned a profit for its investors. In any case, it was bought by Fox and filmed as a silent in 1928. Robert Armstrong and John Mack Brown played two ex-cons trying to go straight who fall under suspicion when a crony from their criminal days steals a pearl necklace from their wealthy employer. The thief tries to get the two to fence the pearls but they refuse. Complications arise when the thief, sensing the cops hot on his trail, stashes the necklace with Armstrong’s unsuspecting little girl, who thinks it’s a birthday present. What follows is a comic round of button-button-who’s-got-the-button as the thief tries to retrieve the pearls; the heroes try to return them to their boss; an implacable insurance detective seeks to get the goods on the heroes, whom he suspects of the theft; and the little girl thinks it’s all a game of hide-and-seek. The mystery I mentioned arises from a reading of Variety’s review of Square Crooks. The reviewer “Mori” praised it lightly as a “moderately interesting” B programmer (it ran only 60 minutes), but added, “Only chance with a story of this kind was to build a central character. But here five different people and a juvenile player divide interest, with the baby drawing first honors.” Mori didn’t identify the “baby”, and neither does the picture’s IMDb listing or the listing for the original play on the Internet Broadway Database (where the credits are admittedly incomplete). So unless a print of Square Crooks survives in the Fox vault (which, for a silent that came out during the hectic talkie revolution, is highly doubtful), the name of the little girl who Mori thought stole the show is probably lost forever to history. Be that as it may, we certainly know who played the kid in the sound remake. Shirley is shown here with Claire Trevor, who plays her mother and James Dunn’s wife. Trevor is younger and softer in Baby Take a Bow than we remember her from her better-known performances — Stagecoach; Key Largo; The High and the Mighty; Murder, My Sweet — she could almost pass for Ginger Rogers here. Baby Take a Bow opens as Eddie Ellison (Dunn) is released from Sing Sing, promising to go straight. His girl Kay (Trevor) meets him at the gate, with continuing tickets for them to Niagra Falls for a justice of the peace wedding and honeymoon. At the same time we meet insurance investigator Welch (Alan Dinehart in an interesting performance), a tinhorn Javert who bluffly pals around with the men of various police forces — and tries in vain to make time with Kay. Everybody, especially Kay, makes it clear that they don’t like him, but Welch remains oblivious, blithely carrying on as if he’s one of the guys. Six years later, when Eddie and Kay have built a happy home with their daughter Shirley (star and character share the given name), it will be Welch who tries to hound Eddie and his pal Larry (Ray Walker) back into prison. Unlike Little Miss Marker over at Paramount, Baby Take a Bow gives ample evidence of having been thrown together in haste. It begins as melodrama, then segues into farce as Dunn, Walker, Trevor, Shirley and Ralf Harolde as the thief chase the pearl necklace up, down, back and forth in the Ellisons’ apartment house. Then for the last reel it shifts back to melodrama as Harolde finally nabs the pearls and kidnaps Shirley to use as a shield in making good his escape. All ends happily, with the thief in custody, the pearls returned, and the heroes exonerated. Even the meddling Welch gets his just deserts. Director Harry Lachman was evidently too hurried — or too clumsy — to negotiate these shifts in tone; the comedy scenes fall particularly flat. The picture’s chief pleasure, predictably, is Shirley herself. But there are other small ones along the way, such as this, a tossed-off scene in which Kay and Shirley go through some dining-room calisthenics while listening to an exercise progam on the radio. Mother and daughter (and the actresses playing them) are clearly having fun, and it’s contagious. Little Shirley Temple continues in her new film at the Roxy to be the nation’s best-liked babykins. A miracle of spontaneity, Shirley successfully conceals the illusion of sideline coaching which, in the ordinary child genius, produces homicidal impulses in those old fussbudgets who lack the proper admiration for cute kiddies. Shirley’s billing on Now and Forever was again above the title, but third this time. Still, when you’re billed third after Gary Cooper and Carole Lombard, you’ve really got no kick coming. 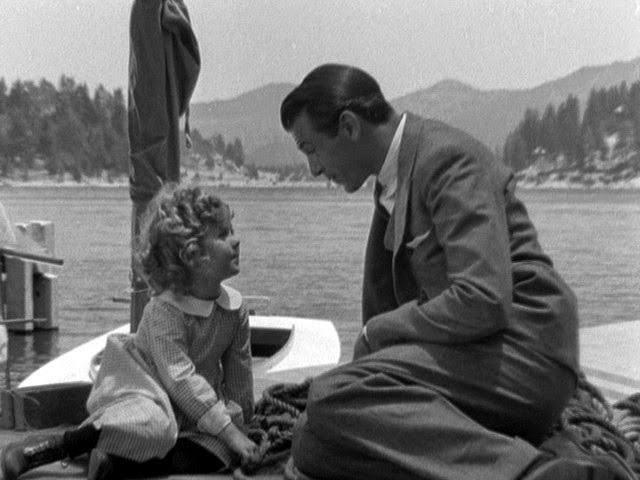 (On screen she gets an “and”: “And SHIRLEY TEMPLE”.) Even more significantly, the music under the opening titles is an instrumental rendition of “Laugh, You Son of a Gun” — reminding audiences of Little Miss Marker the way Baby Take a Bow had reminded them of Stand Up and Cheer! Now and Forever also reunited Shirley with director Henry Hathaway, who had presided over her near-death experience with a pony on To the Last Man. In this picture, Gary Cooper plays Jerry Day, a globe-trotting confidence man, with Carole Lombard as Toni, his accomplice and companion. In the credits she’s identified as “Toni Day”, but the script makes it pretty clear that they’re not married; in the first scene he tells her, “I told you I was married,” not, “was married before.” Anyhow, Jerry was married, but when his wife died, he left his infant daughter with her wealthy, disapproving family; he figures the child must be five or six now. When he and Toni find themselves out of cash, he proposes to go to his stuffed-shirt brother-in-law and sell his parental rights for $75,000. But one brief visit with little Penny (Shirley), who naturally doesn’t know him, changes his mind. He reveals himself to her and takes her with him while his brother-in-law fumes and blusters. First stop, New York, where Jerry runs a scam on a Mr. Felix Evans (Sir Guy Standing) for $5,000 in a phony mining deal. Then it’s bon voyage for Europe to meet Toni in Paris. Their ship is barely out of port before they meet Mr. Evans strolling the deck. Jerry manages to stammer out that he was suddenly called away to Europe, and Evans gives him a smooth, knowing smirk. “Quite a coincidence, Mr. Day. Because the same thing happened to me.” And Evans calmly wishes him a good day. Jerry and Penny join Toni in Paris, where, after a little jealous tension, Toni and Penny bond with one another. Toni has an uneasy conscience over bringing Penny into the lifestyle she and Jerry have adopted, and in his way, so does he. He tries to settle down into an honest job in Paris, but his and Toni’s rich tastes are his undoing. Then the sinister Mr. Evans reenters his life. Evans has his eye on the jewels of Mrs. J.H.P. Crane (Charlotte Granville), a dowager widow who has taken a shine to Penny, and he wants Jerry to help him lay hands on them. That’s really as far as we need to go with Now and Forever because…well, frankly, despite the nostalgic value of Cooper, Lombard and Temple in the same picture, it’s a bit of a dud. The script by Vincent Lawrence and Sylvia Thalberg (sister of Irving) is as bland and pointless as the title, and this sort of ersatz Ernst Lubitsch was never director Hathaway’s strong suit. Shirley sings one song, “The World Owes Me a Living” from the then-current Disney Silly Symphony The Grasshopper and the Ants, which serves as Jerry’s unofficial theme song (he’s whistling it when he first meets Penny). But even that’s a cheat; Hathaway cuts away for a long scene of Jerry stealing an emerald necklace and stashing it in his daughter’s teddy bear, with Penny’s voice barely audible in a distant room of the old lady’s mansion. Now and Forever is really only memorable for two things. One is Shirley’s recollection of the fun of working with Carole Lombard (“If she really employed bawdy humor and truck-driver expletives, it was never within my hearing. Wherever she went she seemed to wear a halo of crystalline happiness.”). The other thing is a scene in which Penny learns that her father is a jewel thief and has lied to her about it. On the set that day, just before the cameras rolled, some blabbermouth inadvertently spilled the beans about Dorothy Dell’s gruesome death. The tears we see in that scene aren’t Penny’s disillusionment with her father; they’re Shirley’s genuine grief at the loss of her friend from Little Miss Marker. 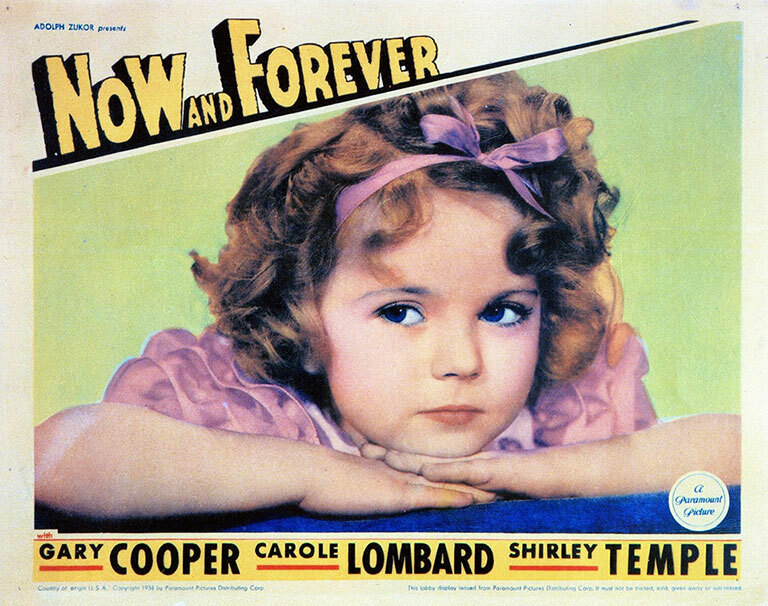 After this second excursion to Paramount, Shirley returned to Fox for her next job, the first real “Shirley Temple picture” — in the sense that it was tailor-made just for her — with the song that, as she put it, would stick to her “like lifelong glue”. Except for a famous near-miss several years later (which I’ll get to in good time), there would be no more talk about loaning her out. If Shirley doesn't make you smile then your heart is made of stone. Anyway, we all hate unsolved mysteries, so I started looking for the little girl in Square Crooks. I went for it perhaps in an unnecessarily roundabout way, but it became quickly clear that the original play had no child part in it (it was for a few years something of an amateur favourite, thanks to limited demands on sets and cast): it was added by Fox screenwriters. Many reviewers followed Mori by saying the kid was a hoot, but Film Daily called the kid "him". That's not the end of it! We've all known the kid's name all along, as he's listed both at ImdB and the AFI catalogue, but with wrong character name. Phillip Carson was an adult part in the original play, and appears to have been eliminated from the film, but by mistake researchers must have allotted the part to the kid actor. A boy of fleeting minor (pun unintended) stardom, playing Herbie in Van Beuren's Smitty two-reelers. Too bad his career was virtually over by 1929, although I suspect that his filmography is far from complete. There, my good deed of the day! Thanks for stopping by, Charles! Thanks also for your kind words about Cinedrome and — most of all — for the crackerjack detective work in tracking down the identity of little Jackie Combs. He's a cute little dickens on that casting card on Amazon. I wonder if he's still with us; the IMDb doesn't say. (I won't bother to rewrite the pertinent paragraphs, so readers will kindly switch the gender ("little girl") accordingly. I'm also heartened to see that Square Crooks has survived and is safely ensconced at MoMA; maybe we will get a chance to see it, and Jackie, one of these days.